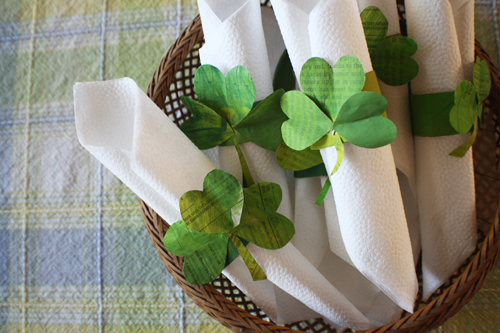 For a last minute St. Patrick's Day craft, you and your kiddos can whip up these nifty green bracelets to share with the non-green wearing crew or you can use them as napkin rings to gussy up your St. Patrick's Day dinner whatever it may be. All ya need is one paper towel tube, scissors, newspaper, paint, glue and tape...lookie! 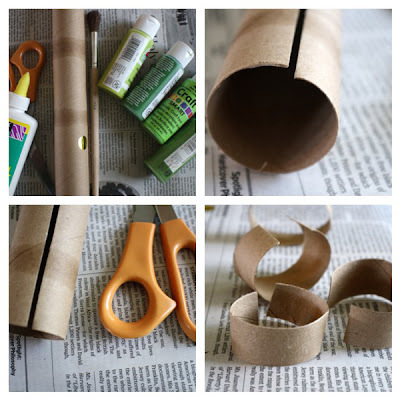 First of, cut your tube down the middle/center from one end to the other. 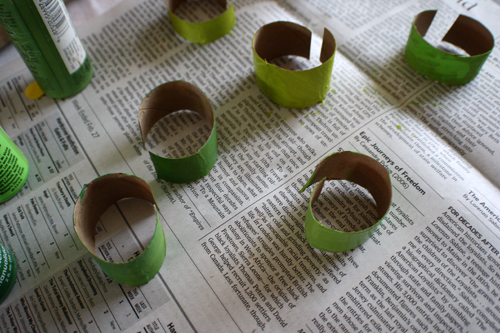 Next up, cut the now open tube into 6-10 pieces depending on how wide you want your bracelet/cuffs or holders to be. Whip out a couple of different shades and tints of green paint and have your kiddos paint each piece. Don't forget to work in a paint friendly area and stick with a tempera or acrylic. Acrylic paint stains but offers a sturdier cover over the cardboard. Set aside to dry. 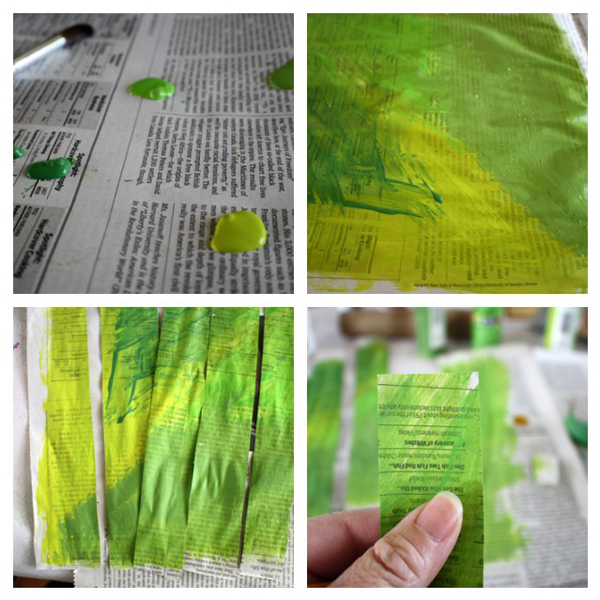 Drop a few blobs of paint onto a sheet of newspaper and get to mixing it all up with a paintbrush or two. You can also toss in a couple of alternative paint brushes if ya like. 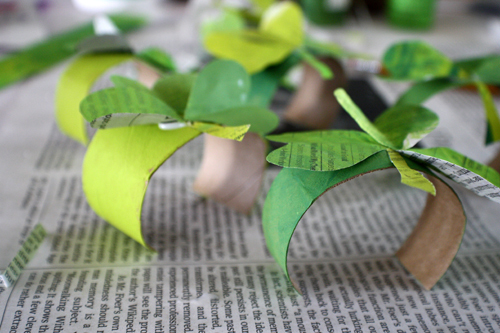 The goal is to cover the sheet of newsprint with all sorts of happy green. Set aside to dry. Once dry, cut a 1 1/2- 2 inch-wide strip of painted newspaper and fold it into thirds. Depending on how long the strip is, you may be able to fold your strip into more parts. Keep the final piece about an inch or so square. imagine a heart-shape within the square. This will soon become the parts of your shamrock. Trim excess wonkiness from the folded piece and set aside. You will use the trim a wee bit later. 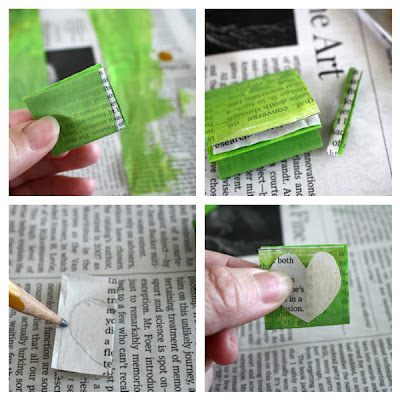 Cut a piece of scrap newspaper equal to your folded square. This will be the pattern/template for your hearth-shape. Fold in half, do the whole half-a-heart deali-o and liberate it from the newspaper. Place liberated heart atop your folded/painted strip and have your kiddo trace the heart shape with a pencil. If your kiddo is old enough, they can simply fold the entire shebang in half and free-form their own heart shape. However, these few extra steps might slow them down a tiny smidge and give you a slight second head start for yourself. Use the scissors to cut through all the folded layers to produce a handful of wee hearts. These are your shamrock pieces. Fold each heart in half-lengthwise to give it a tiny bit of dimension. 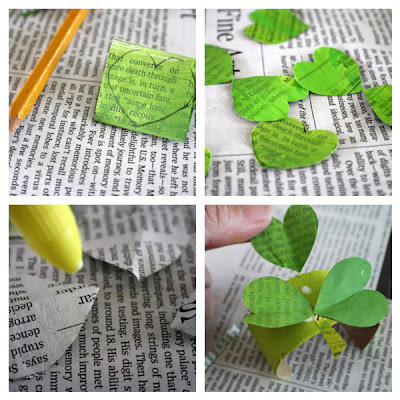 After all cutting and fussing has been cut and fussed over, create a stem for each shamrock using the excess painted paper you initially trimmed from your folded piece. Add a drop o' glue to the back at one end and center it atop a soon-to-be bracelet, cuff or napkin ring. Repeat for each one prepped. Next, select three heart shapes of equal cut and arrange in a shamrock shape that is pleasing to your eye. Flip the pieces over and add a drippy-drop of glue to the bottom point. And I do mean, drippy drop! Too much glue will cause the shapes to slide every-which-way and may cause later frustration at their refusal to remain parked on your kiddos cuff, bracelet or napkin ring. Flip over one side piece and place atop cuff, bracelet or napkin ring radiating away from the stem. Next add the other side and finally the center heart. 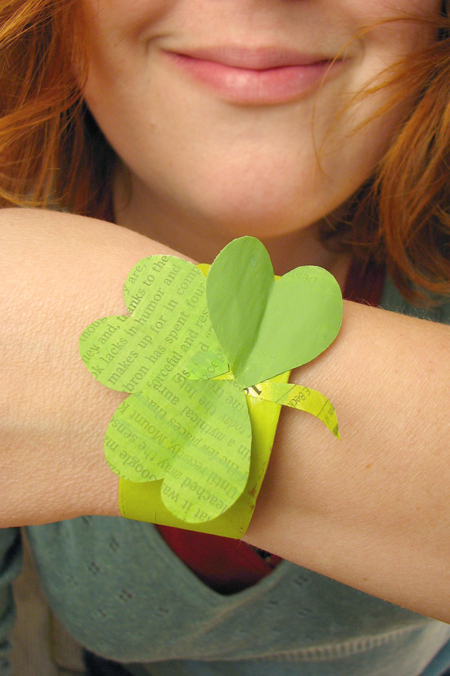 Lookie there, you have a rockin' shamrock! Repeat for each piece and set them all aside to dry. I do believe this would be a very good time to make a minty green milkshake. Once your objects d'art are dry, place them on available wrists or tape them closed and snuggle a cloth or paper napkin inside each one and get ready for a feast! Enjoy and happy official green-wearing day! 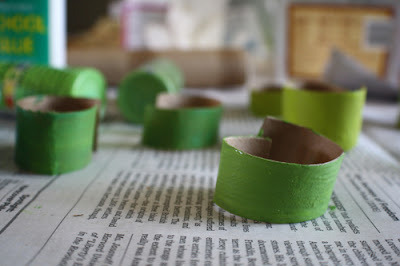 **I've been looking at the napkin rings that I made (and have been using) and think perhaps a coat of mod-podge would sturdy them up a bit. Or maybe glueing the hearts onto cardboard as well. I dunno, just thinking, they really are quite pretty and the newspaper just won't last forever. What do you think? Love it! I was just looking for a fun and easy St. Patty's day craft to do with the kiddos, and I think this is it! Thanks for sharing!! So cute! Very simple and lovely! we are SO making these! but what is this 'newspaper' of which you speak??? This is a fun craft and it looks good. I would not make it more permanent. 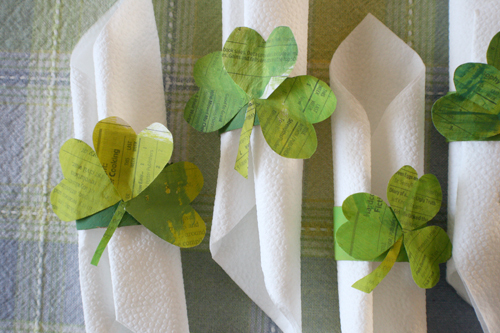 Like Easter eggs, shamrocks are not meant to last forever! So clever! I spent the afternoon fashioning ours. I found that modge podge was necessary to help keep the bracelet form so that the kids can love to pieces on Thursday. After that, we can look forward to making more! i like the non-permanence element too and, at the same time am so glad the mod podge will sturdy it up. Do you have pics? we're doing this at this very moment! These are way too cute! I love them! If you want the project to last a long time after you paint the newspaper spray if with stuff that makes it acid free. Then after it is dry you can put the mod podge on to make it strong. Hi Gina, thanks, that sounds cool!